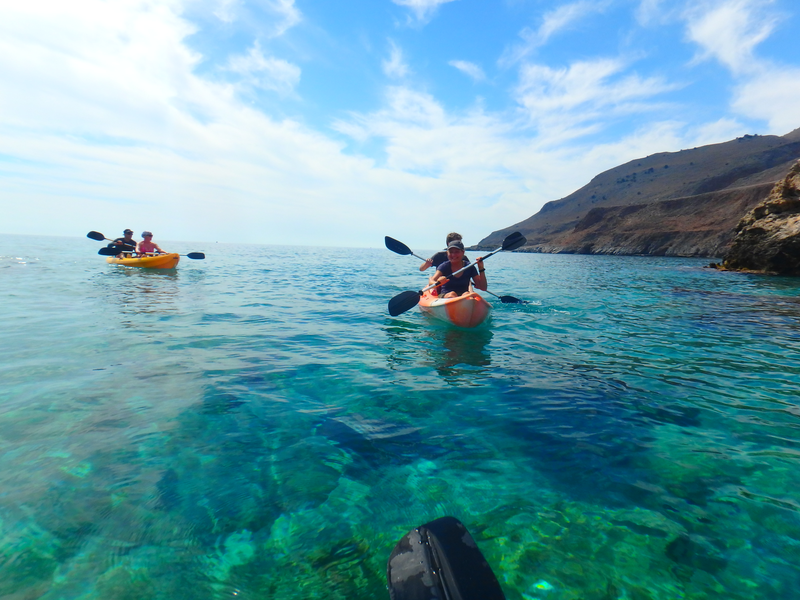 Activities in Crete – holidays program for Crete Greece: Summer holidays on Crete: On this page you will find a program with activities we do during school holidays in the spring, summer and in the autumn on Crete. Program Zorbas Island summer: Sometimes a day is mentioned twice on this list, which is because of our two-week program. There are active weekly and two-week activities. Summer and winter activities program for all year round holidays. 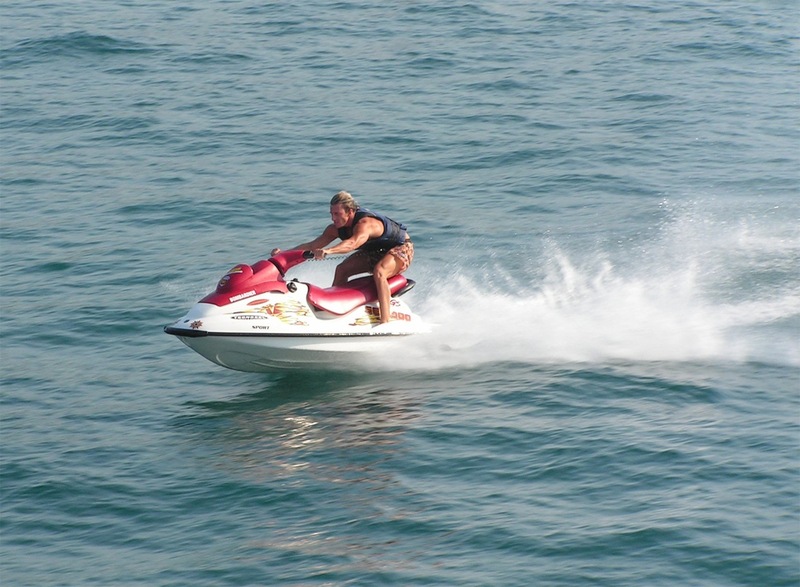 When excursions are booked in advance, these will always take place. If you want to have more information about our weekly excursions, you can mail us. 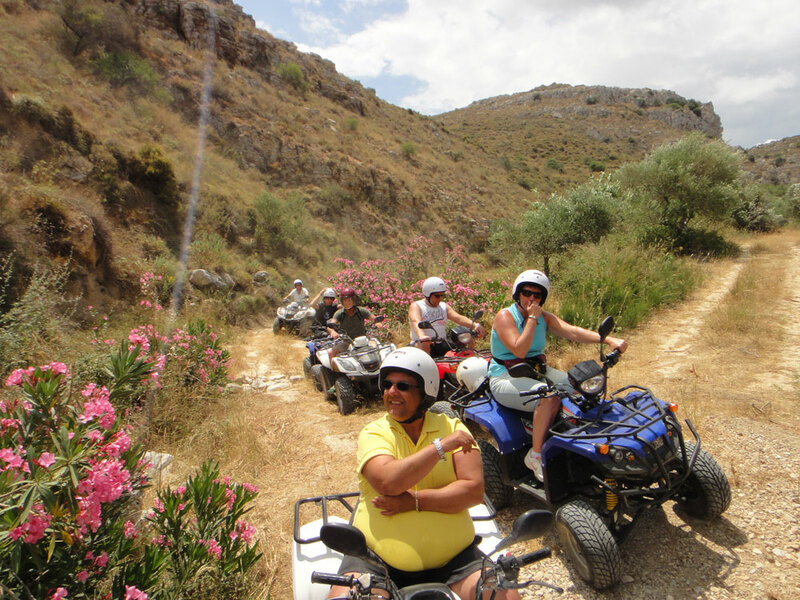 We also have offers for weekly excursions in combination with your stay on Crete. There are excursions that take place every other week. Below you find all the possibilities. Active holidays on Crete. Sometimes a day is mentioned twice on this list, which is because of our two-week program. 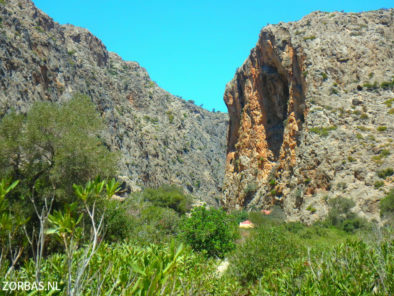 Monday: Unknown Crete (village tour, starts at 10.00 hours): Unknown areas in central Crete. We have several unique routes. We show you villages and the Cretan culture in the mountains, places you would never come on your own. 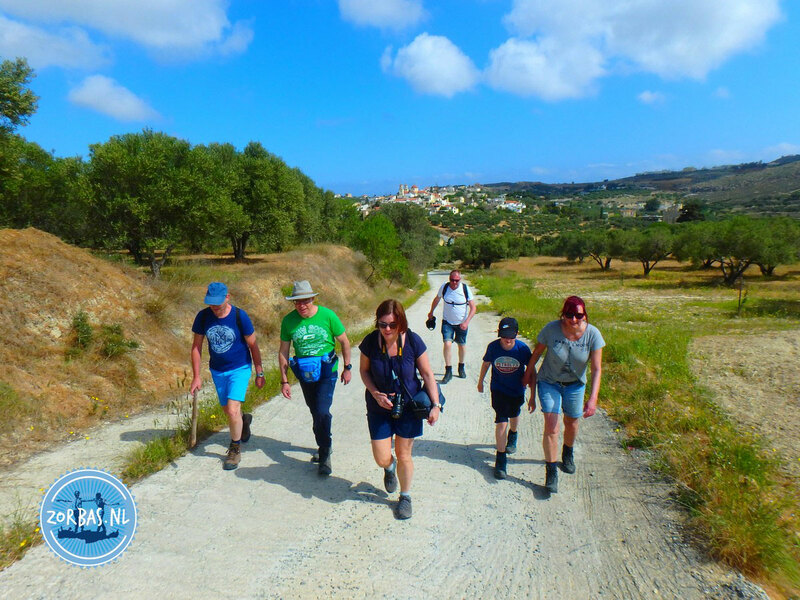 During this excursion we regularly stop to make short village walks, we visit a pottery, churches and monasteries. We drink coffee in a typical village kafenion (coffee house) and have lunch at a local cantina. En route you can make really beautiful photos, enjoy the nature and get to know the local people and their culture. 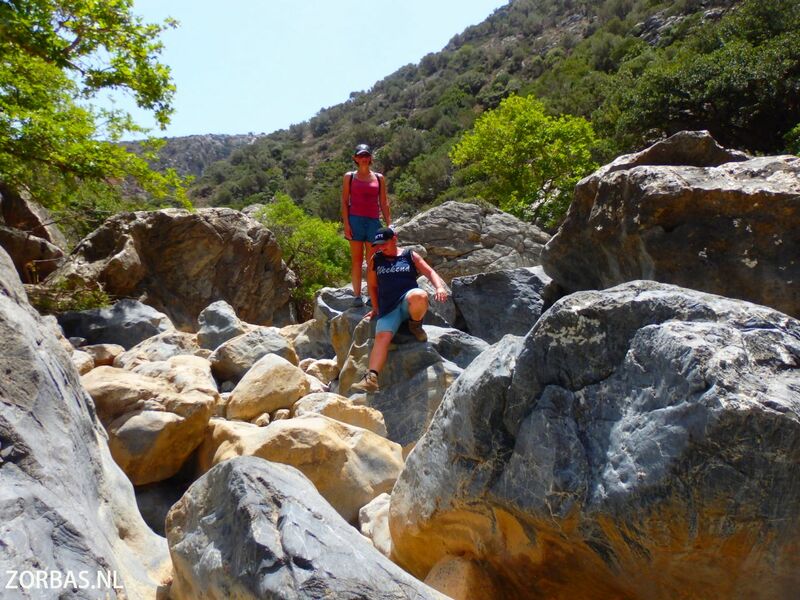 Monday: Puzzle Tour on Crete – Car Puzzle Rally – Geocaching on Crete – GPS Tracking on Crete: An adventurous puzzle tour for everybody! 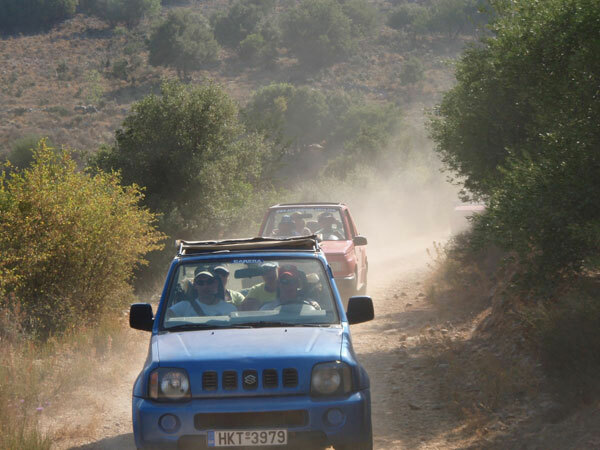 A fun day on Crete, whether you join with a family car with 9 persons or together in a Fiat Panda! We form a few teams, who will regularly meet up together during the day on the road. Each team gets the same questions and the same mission: explore Crete with a puzzle. The puzzle tour has questions about mythology, history, nature, geology, etc. 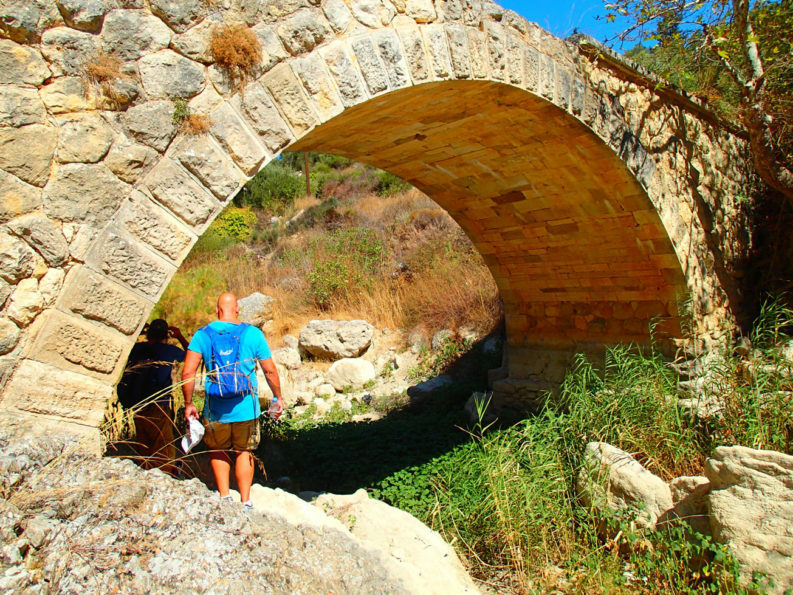 This puzzle tour on Crete is in a beautiful area, so you’ll see a lot, but also have enough to explore, like navigation, searching for geocaches, answer questions for the puzzle and lots of adventure! 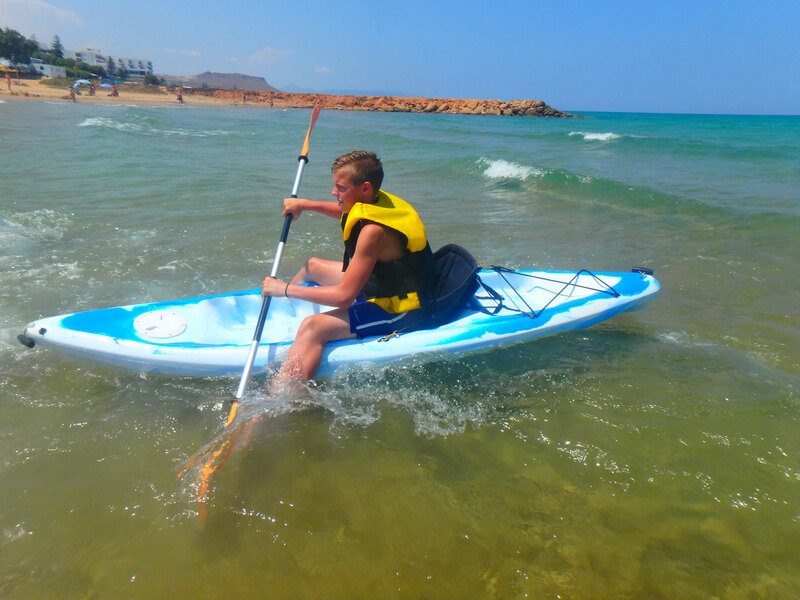 Monday: Beach Party & Adventure day for the whole family (starts at 11.00 hours): An active day on Crete for young and old: barbeque on the beach, beach football, tennis and volleyball, snorkelling, build a sea raft, canoe race, body board race, tug-of-war. 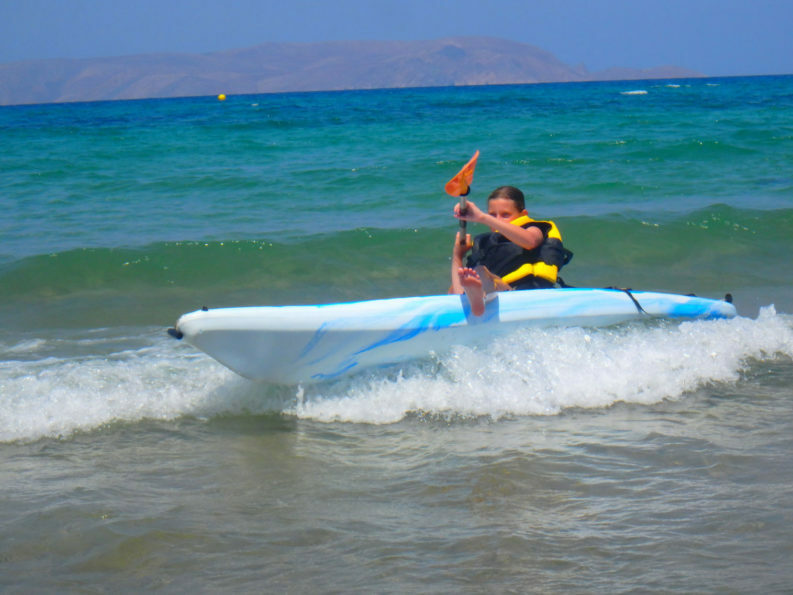 Beach activities in the summer on Crete: In the warm summer months of July and August, the weather is always beautiful around the Mediterranean. One day is warmer than the other. That means that you need frequent cooling down moments. But it really is not that there is nothing you can do at all because of the heat. 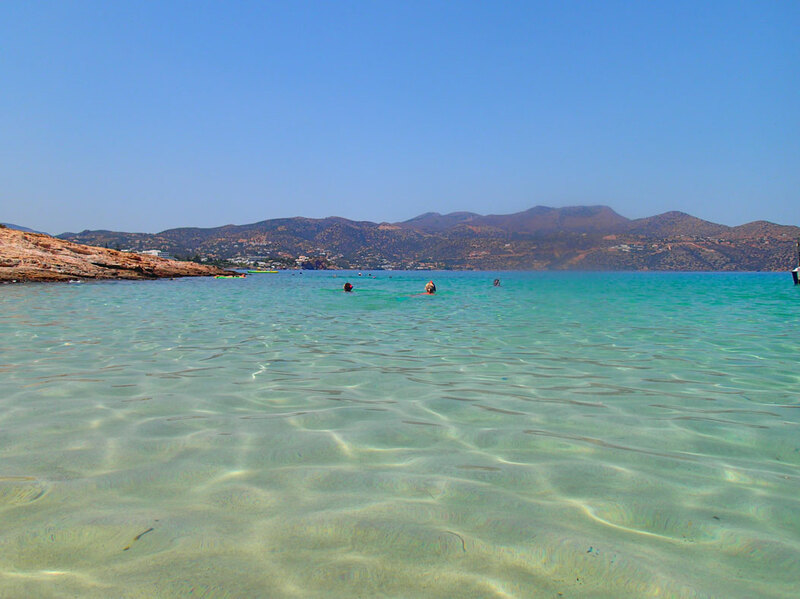 In the summer vacation on Crete, we organize weekly a beach party, which is fun for the whole family to join. Sports on the beach like beach volleyball and beach football are favourite, but the canoe race is also very popular. The beach activities on Crete make you feel hungry, so as a reward there is a BBQ on the beach. Cooking – walking – adventure day “Agia Ioannis” (starts at 10.30 hours): Cooking at a little church in the mountains with great views. There are plenty of places with shadow. 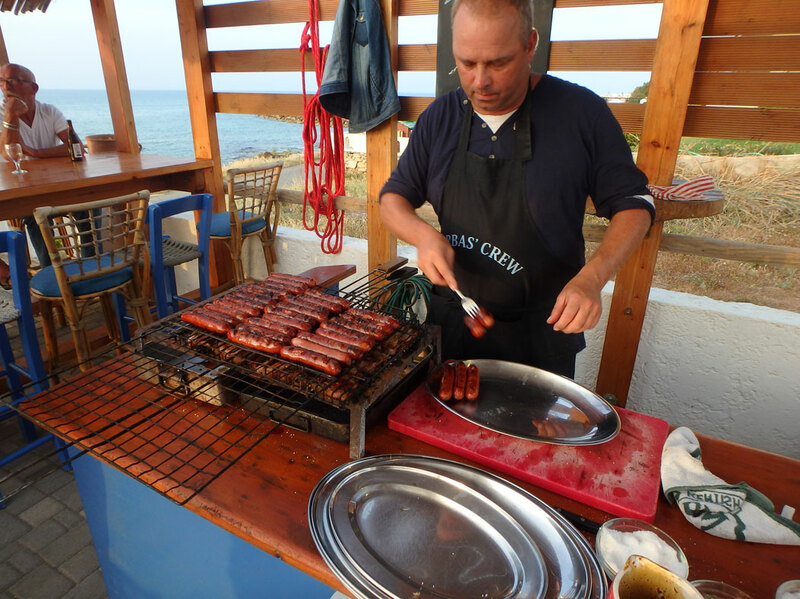 Here you will be cooking Greek food with our cook and learn dishes you can make back home as well. 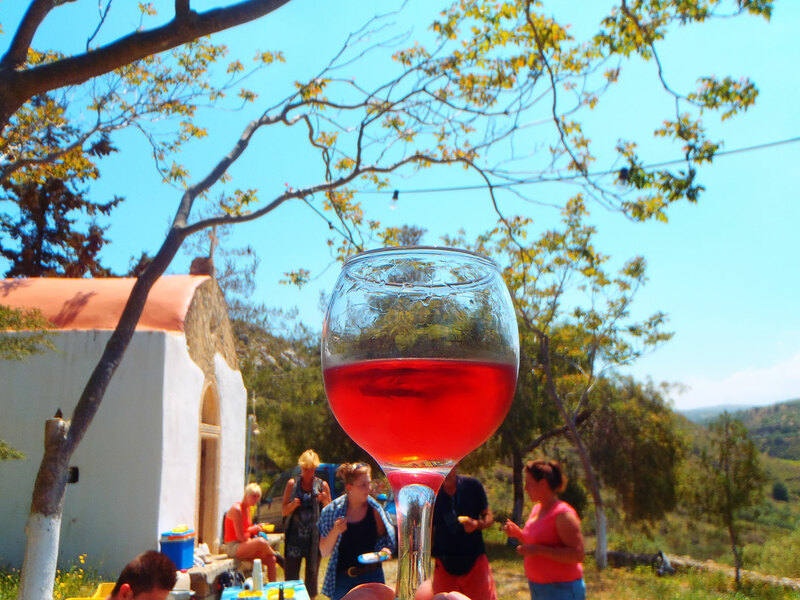 You can taste also local Greek wine. Whoever wants to walk, comes with us to a different spot en returns later at the cooking workshop location. The walk is about 6-8 kilometres. 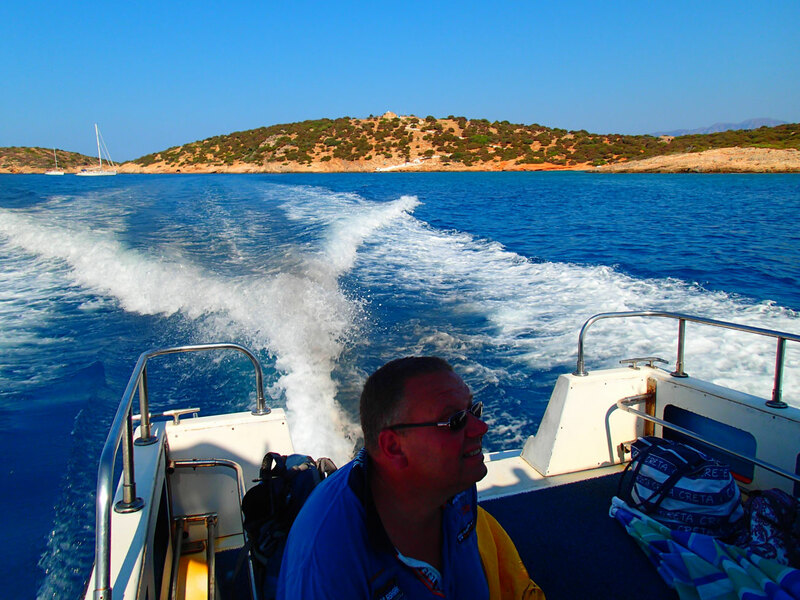 There are also possibilities to extend the walk and continue back on foot to Zorbas Island (with or without GPS). 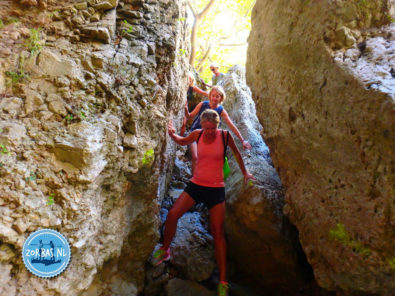 Adventure possibilities starting from Agia Ioannis: In this area are many possibilities; after a short walk we arrive at a hill, which is a perfect spot for abseiling (rappelling) and Slacklining (balance games or trees trail). At the cooking location are possibilities for archery (bow and arrow) and a trail through the trees. We can even organise a GPS puzzle tour with geocaches. For lunch you taste the lovely dishes of the cooking workshop. Cooking – walking – adventure day “Toupaki” (starts at 10.30 hours): Cooking on a hill between the mountains. It is a unique spot at an old little church and a small authentic house surrounded by pine trees. There are many shady spots. 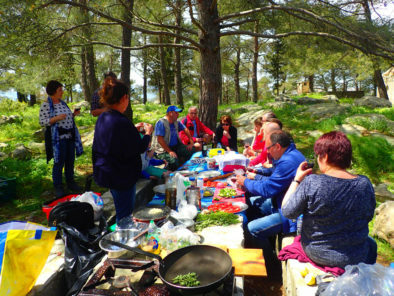 At this location we will cook in a wood oven, a cooking lesson other than described above. Even in the small house we use, is an old stove where we make with wood a fire and deep-fry Greek fries in olive oil. You can taste also local Greek wine. Hiking: the walk through nature and the village walk in the area of Toupaki is beautiful with lots of green and a feel of the Cretan village life. This walk is about 3-4 kilometres. This walk can be extended to 8 or 12 kilometres. 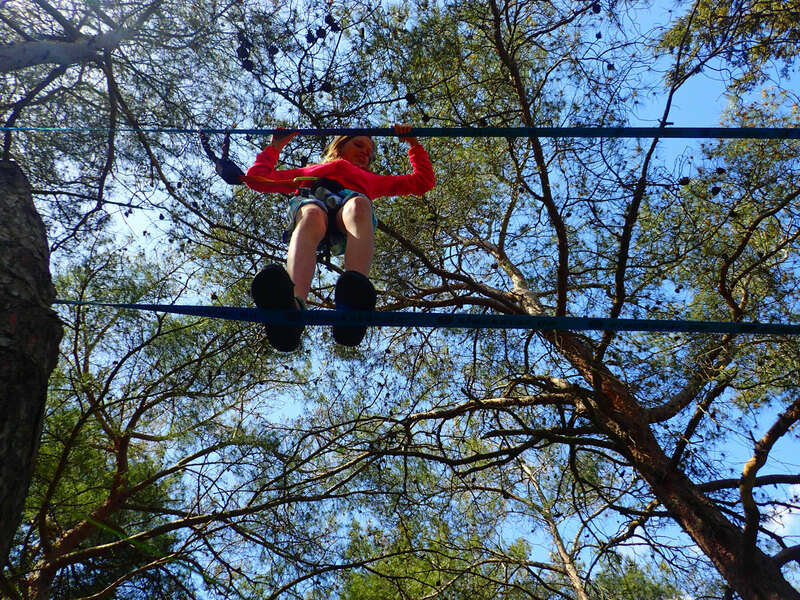 Adventure activities: Slackline games, climbing trees with lines, zip line, archery and badminton. We eat lunch on the mountain of Toupaki. 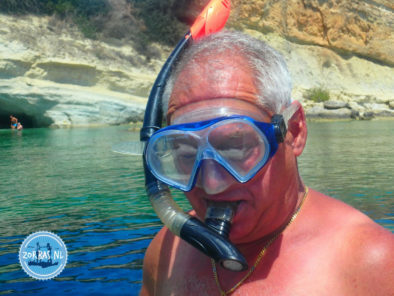 Wednesday: Snorkelling, fishing, walking or beach (starts at 10.00 hours): A tour to a wonderful bay where even with a lot of wind snorkelling is possible. We have snorkel charts, where you can see what fish are to be seen underwater. 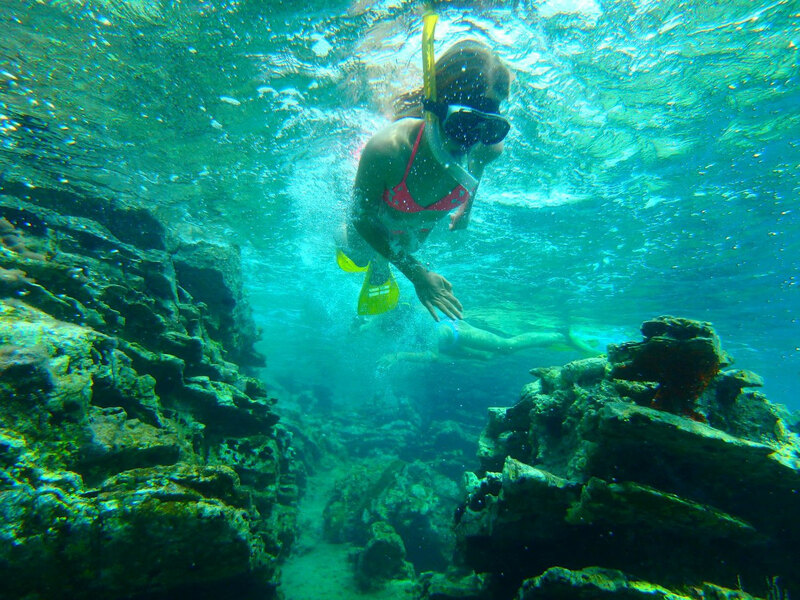 Here is a beautiful reef for snorkelling, where you can also go fishing. Would you like to borrow a snorkelling set or a fishing rod from us? Please let us know upfront! 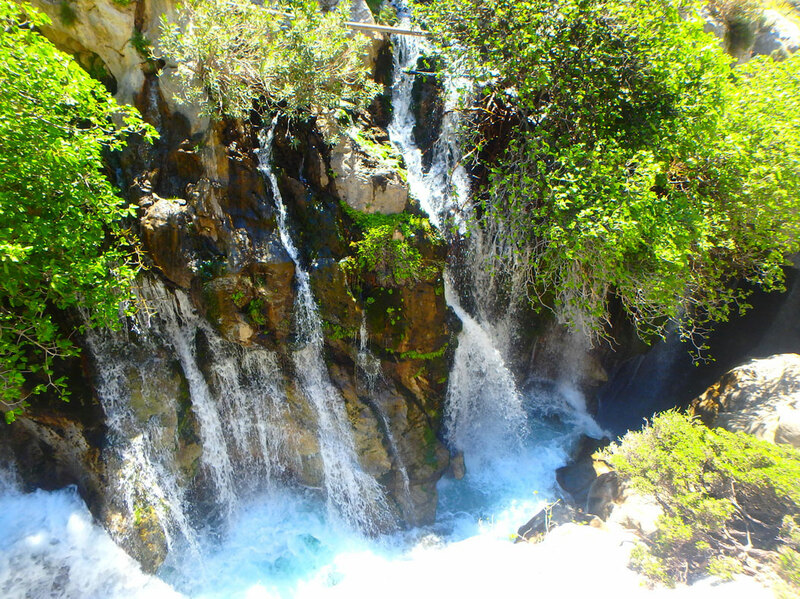 Hiking: there is a gorgeous walking area from the snorkel spot for hikes of 5 to 10 kilometres. 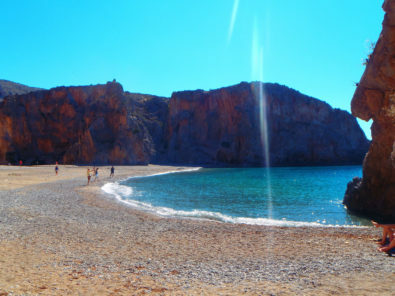 Of course you can also stay for sunbathing on the beach or swimming in the sea. We have lunch on this beach. 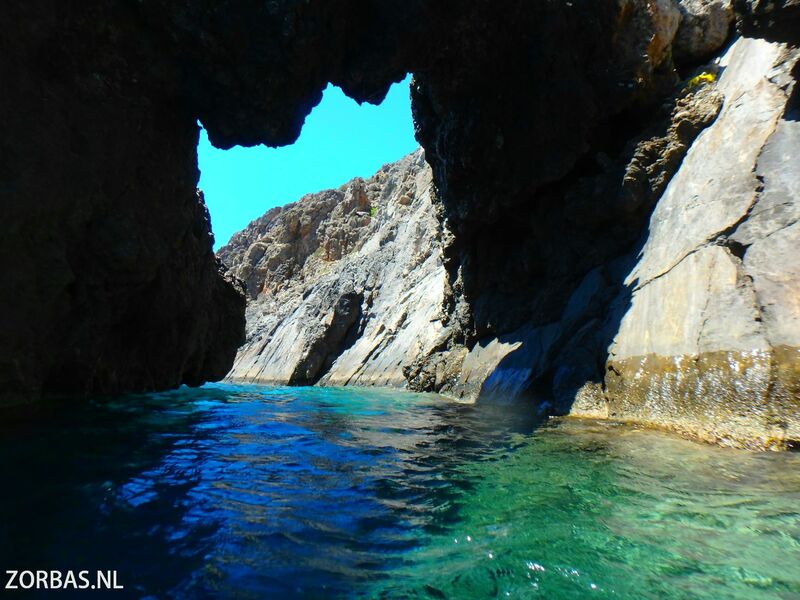 Wednesday: Agio Farango, hike through South Crete with snorkelling (only upon request, starts at 07.00 hours): A great tour to the South of Crete with the most breathtaking views. We make a pleasant hike through an impressive gorge and we end up on the beach. The hike is only 4 kilometres to go and come back. Here it is fantastic for snorkelling to the caves underwater or just for a refreshing dip in the Libyan Sea. From the beach you can even go for a walk in the mountains to a hidden lake between the rocks. We have a nice roundtrip for the climber and hiker. We eat lunch on the beach. Thursday: Jungle hike through the canyons of Skalopatie (starts at 09.00 hours): This is a hike through a unique piece of nature. 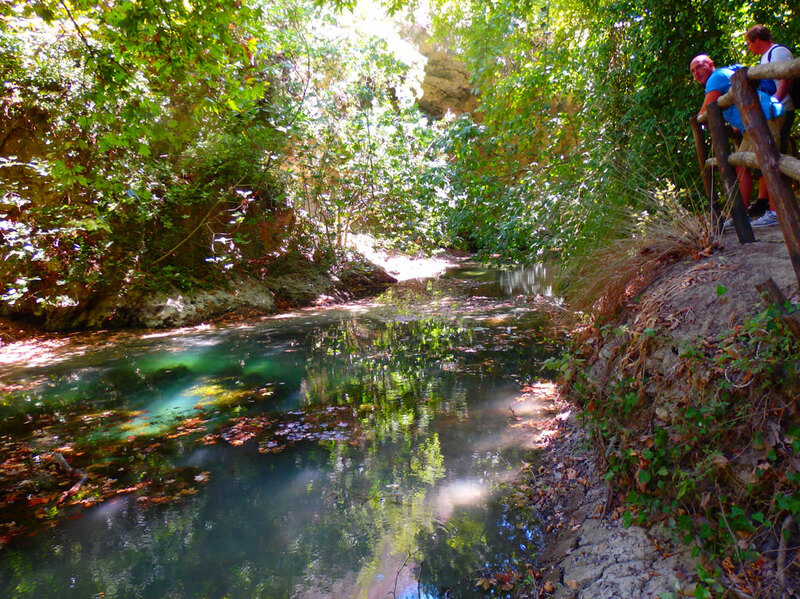 The vines hang in the trees, summer and winter it is green here with lots of shadow, sandstone formations and a little stream with cold water. For Skalopatie we have 2 hiking options: an easy shorter walk (also suitable for children) and a longer difficult hike. For the hikers who wish to go for the longer option, we split the group up after lunch. The shorter walk of Skalopatie is 5 kilometres through an easy area, we descend slowly the mountain. 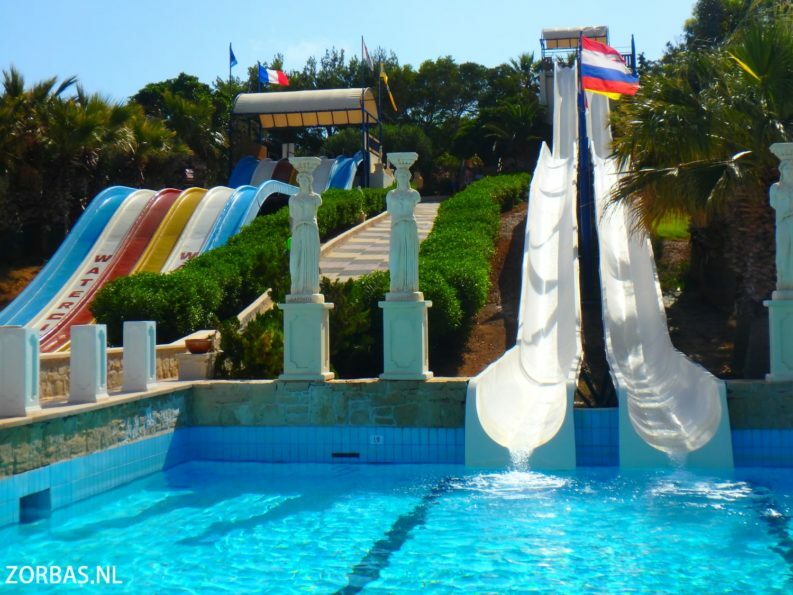 The persons that want to go back after lunch to the swimming pool or the beach will be returned. Whoever wants to continue hiking, can do so (the total distance of the hike will then be 10-12 kilometres). You will be rewarded during this part of the walk with turtles living in the wild, walls with fossils, ruins of a church, etc. 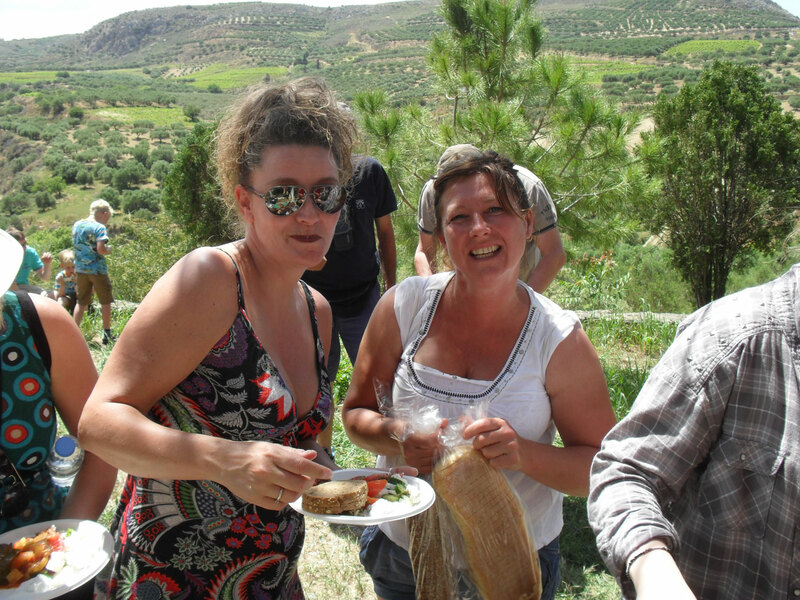 We eat lunch in the canyon of Skalopatie. Thursday: Aposelemis Gorge, be aware of the vultures! 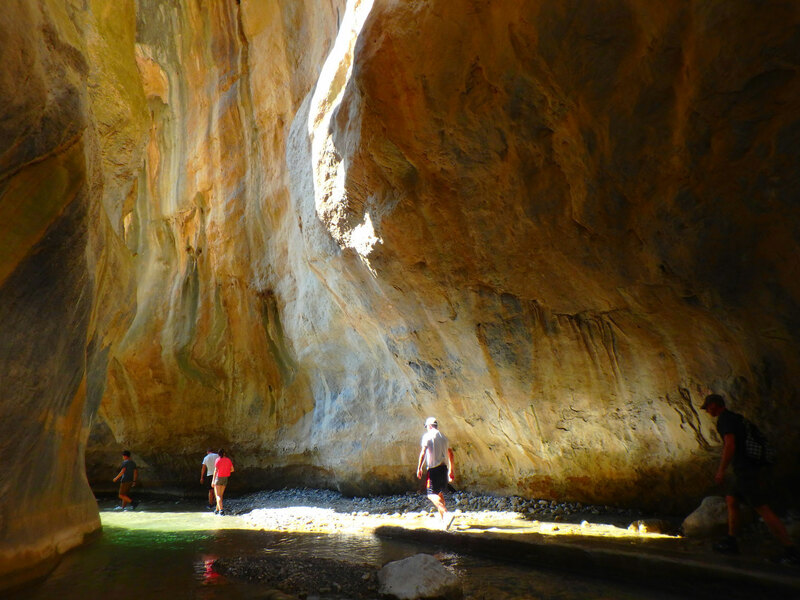 (starts at 09.00 hours): This gorge is a hike with a lot of climbing and trekking. This gorge has been created long ago by shepherds and they still use it every day. The gorge is breathtaking beautiful, a piece of nature you will never forget. Halfway the gorge is a cave, where the vultures live. The wingspan of these vultures can be even 2 meters. This hike is about 8-10 kilometres. We can also extend this hike to 12 kilometres. There are possibilities for a distance up to 18 kilometres by using a GPS. Good hiking boots or sports shoes are necessary. Lunch will be somewhere in the gorge. Friday: Zorbas boat trip to Sissi (starts at 10.00 hours): Sailing with the Zorbas boat to Sissi with a visit to the bay of Agio Giorgos. Here is a cave in the water, but you will have to swim to it. 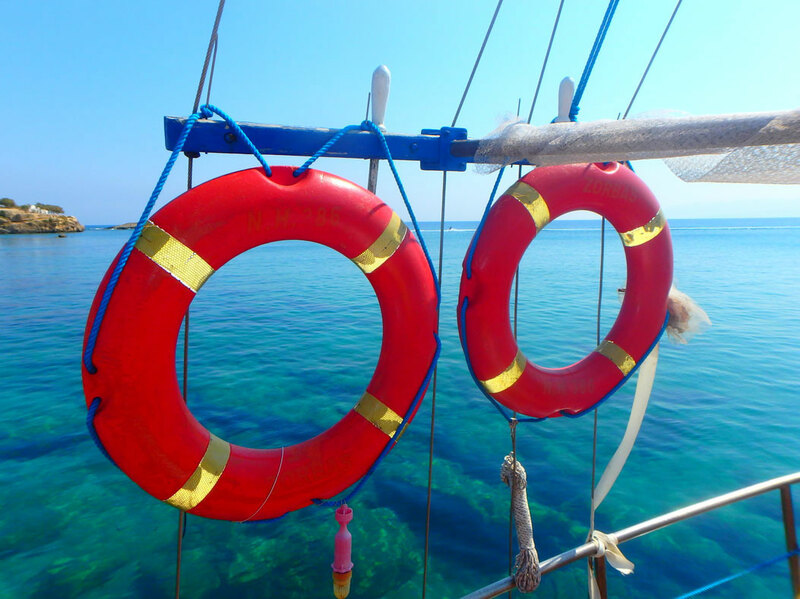 From the boat you can also go for swimming and snorkelling. 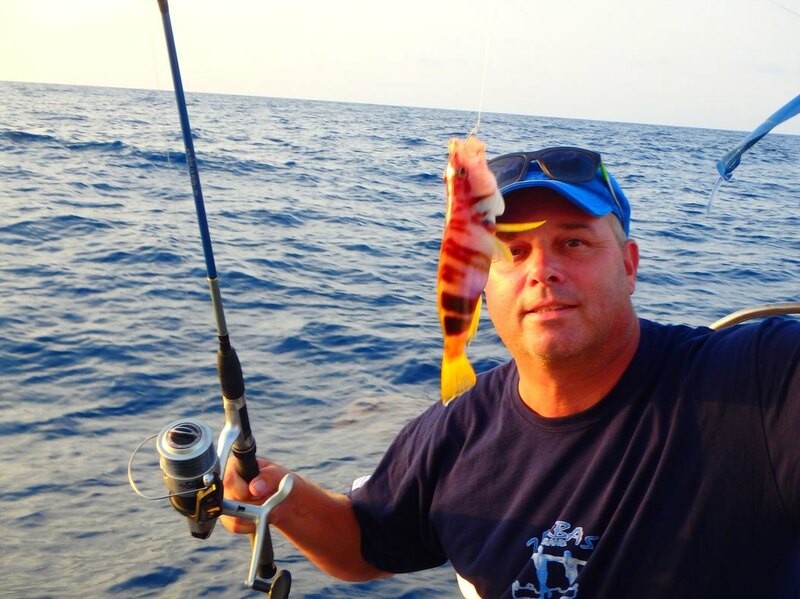 There are possibilities to do some fishing with a line behind the boat. 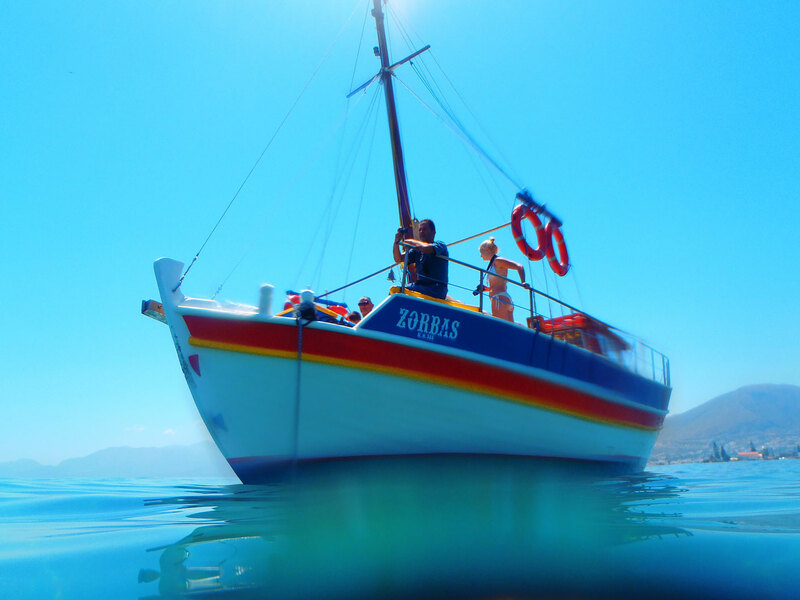 The Zorbas boat sails along the coast of Crete, which gives you beautiful views of the island. Sissi is a harbour village with little shops and a beautiful palm bay on the right side. 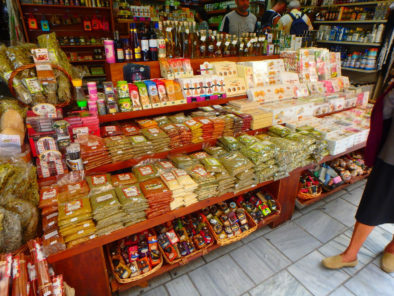 You can choose in Sissi from many restaurants or just go and eat a gyros or souflaki. 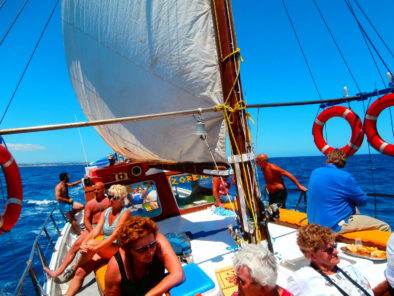 Friday: To Dia Island (starts at 10.00 hours): Upon special request we can sail with the Zorbas 2 boat to Dia Island. 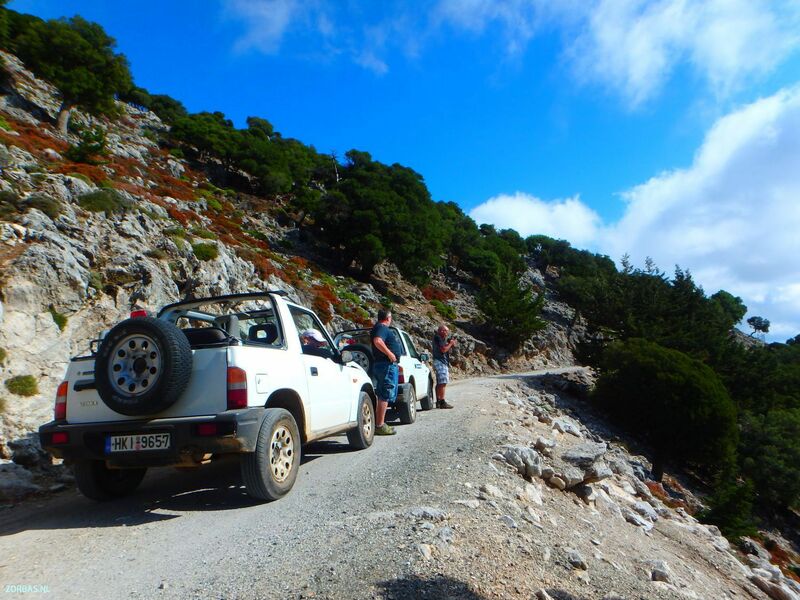 Friday: Jeep safari through unknown Crete or Quad safari (jeep safari starts at 08.00 hours): A fantastic tour through the countryside of Crete. 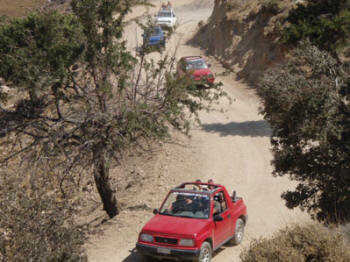 Mainly off road we guide you through the unspoiled areas that have seen very little tourism. 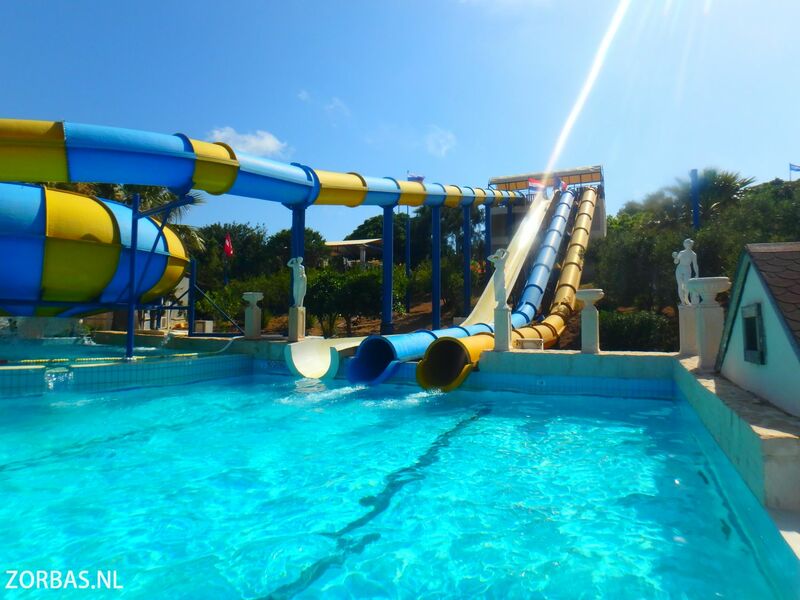 It is a great adventure where you can enjoy some of the nicest parts of the island. 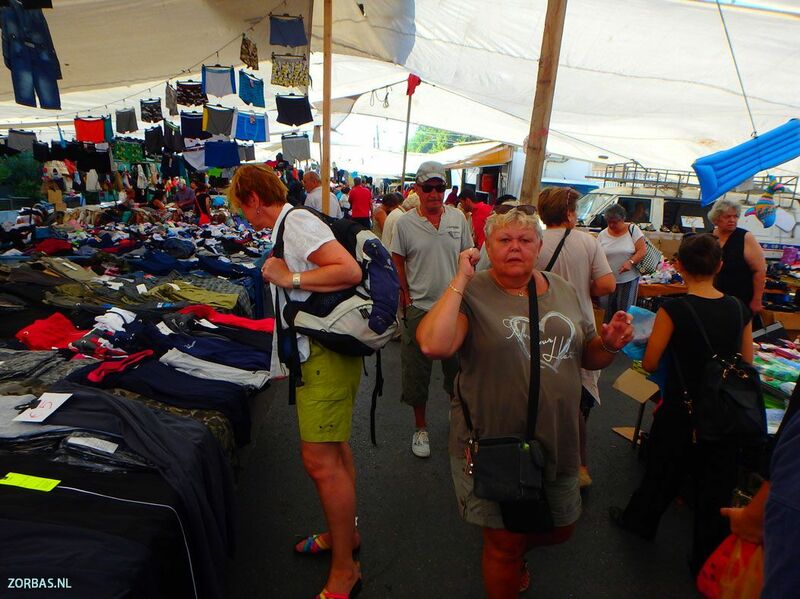 Saturday: Market Heraklion: A visit to a big gypsy market in Heraklion. Ask for the options! 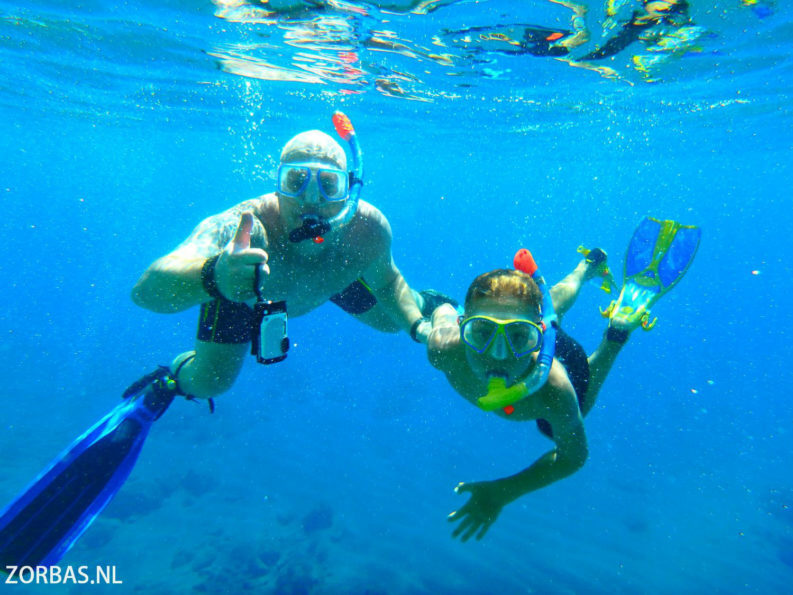 Saturday: Snorkel and dive lesson for children (starts at 13.00 hours): An exciting, but mostly fun introduction lesson for diving and snorkelling. 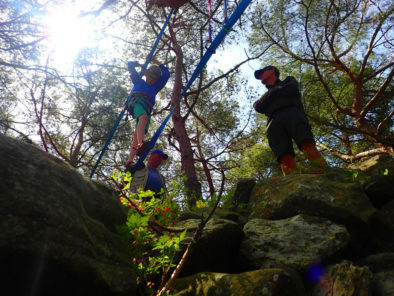 The children are guided by qualified instructors. 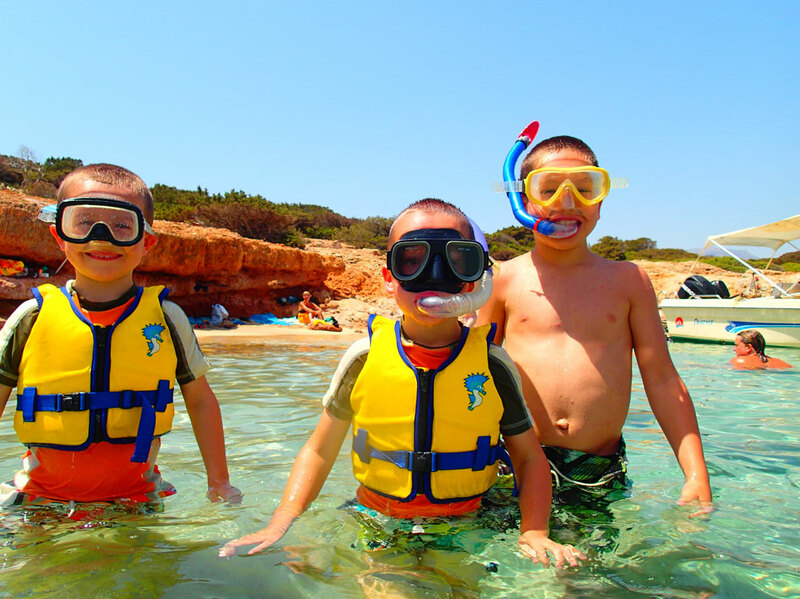 With a variety of games and exercises, the children become familiar with diving and snorkelling. This is really an adventurous and educational afternoon for children. Our younger guests will get a snorkelling lesson. 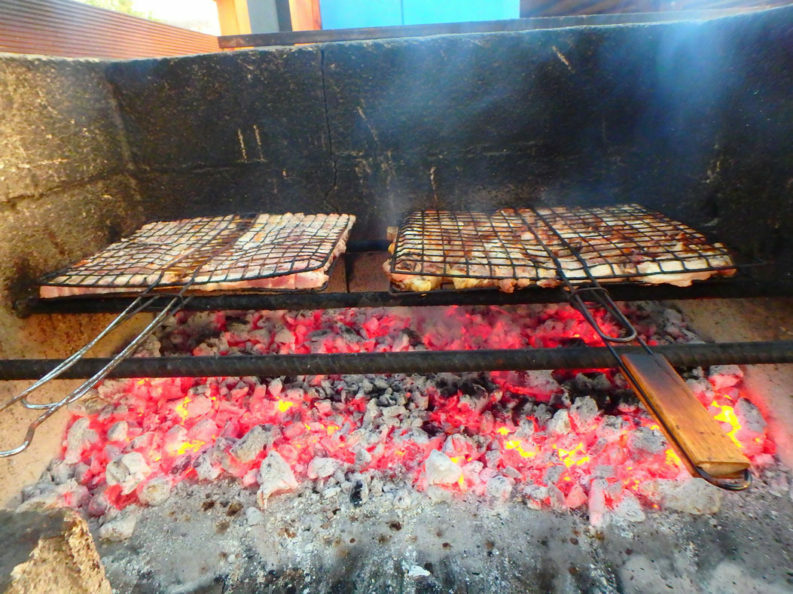 Saturday: Zorbas BBQ evening (starts at 20.00 hours): Every Saturday evening we organise a traditional Greek BBQ. You can eat whatever you desire and taste all the different dishes. Zorbas dinner is every day from 20:30 hours. Zorbas breakfast is from 8:30 until 10:30 hours. Night fishing on Crete: With a fishing boat out at sea for fishing, everything is there from lines to rods. Puzzle tour by car: Also this summer we have again an exciting puzzle tour. This is great fun for all ages. The most fun is to do this puzzle tour with more groups and rental cars. Looking at the stars and planets on Crete: Before we go to the beach we give a short explanation about our solar system. Which planets and stars can be seen today from Crete? Then we go with our telescope to a remote beach in the area to look at the stars and planets. 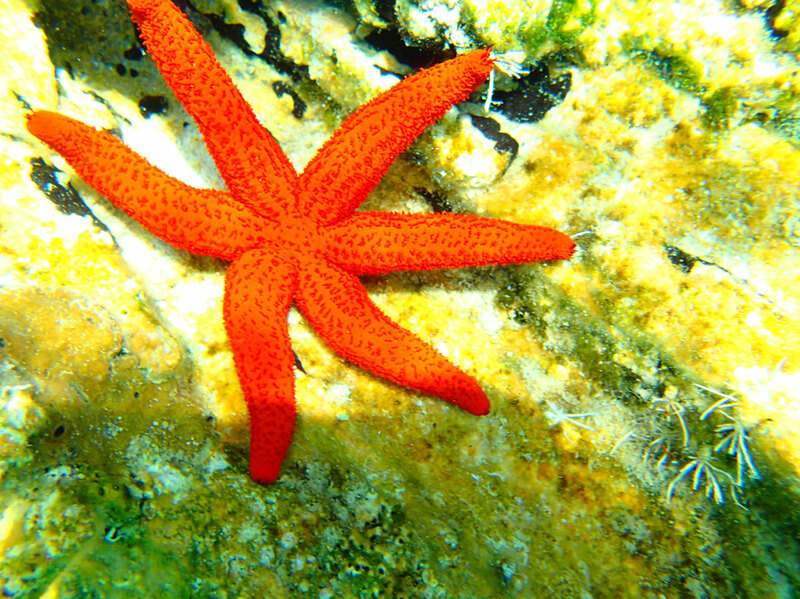 You will be surprised how many there are visible from the beach! 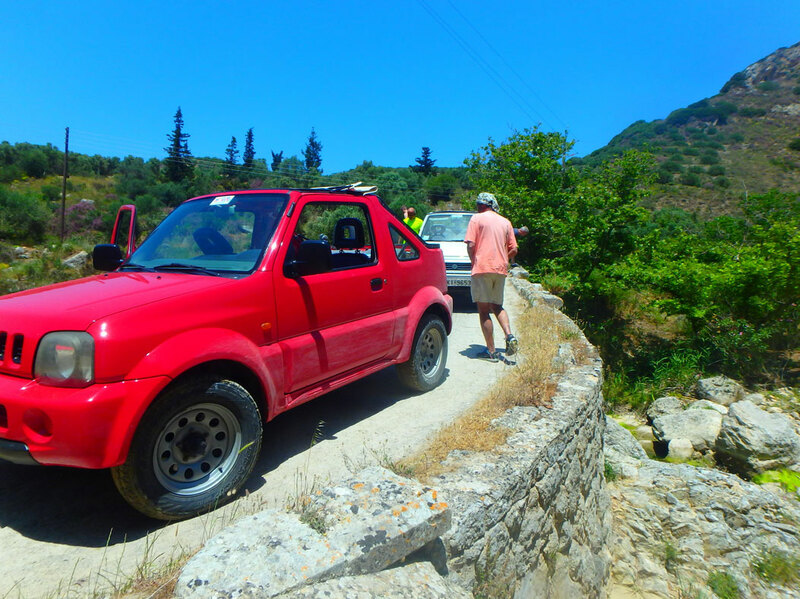 Car routes & GPS on Crete: A new way to discover the most beautiful places on Crete. This year we use a folder with plasticized charts with an explanation about car routes on Crete and GPS routes. 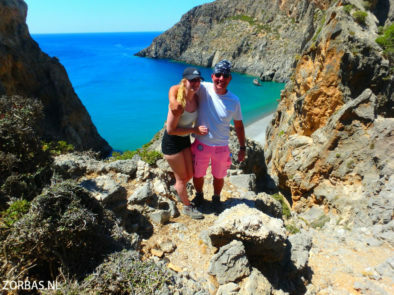 Whether you want to drive half a day in combination with snorkelling, walking and beach or make a longer car trip combined with nature, culture, geology, archaeology, villages of unknown areas of Crete, we have worked it all out into detail. We do have some car routes online to give you an example. 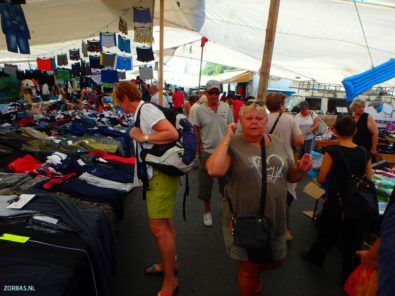 For your holidays we have a large folder filled with various routes that you cannot find online, since we like to keep these routes unique! Heraklion: A visit to the capital of Crete. Do you think that Heraklion is just a dusty busy Greek city? On the contrary! This city walk shows you special (new) places, from the market in Heraklion, museums, little streets with authentic shops to a visit at Knossos. Hike through the gorge of Sarakina (South Crete): This is a hike where you will not remain dry; there is a little part with swimming involved! We organise also other hikes on Thursday. Slackline adventure! This summer we have new outdoor activities especially for children and youngsters: Slackline, Via Ferrata and many other outdoor activities at various locations on Crete. 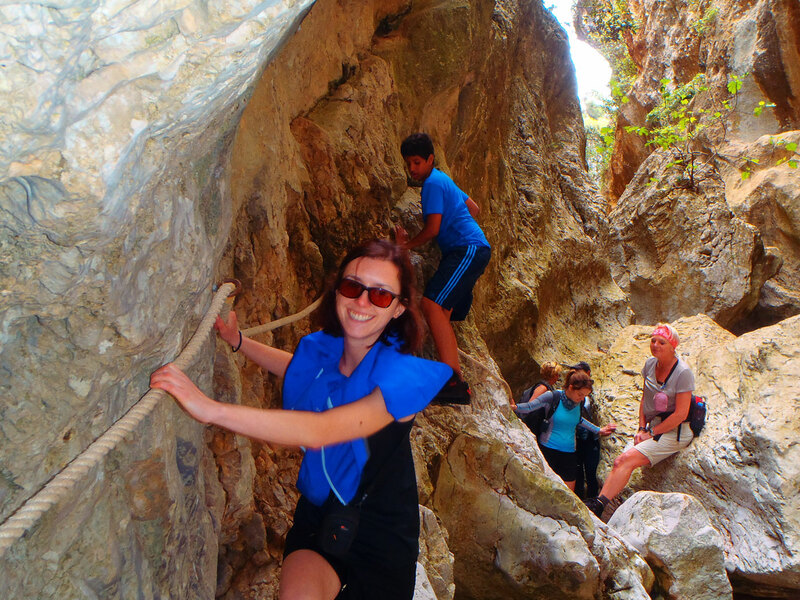 Whether it is building a raft during the beach party or Via Ferrata, a zip line or Slackline in the mountains, everything is possible! Being on holidays with your parents is boring? Of course not, there is enough to do for everybody! 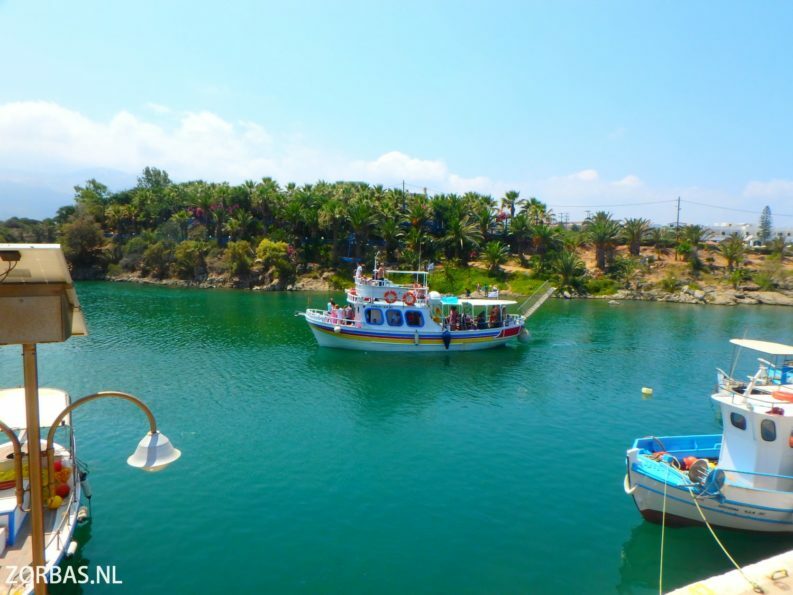 Eco Park Crete: A visit to the most beautiful ecological park of Crete. We combine the visit to the park with a short walk at the Lassithi Plateau. You can admire many traditional crafts in the ecological park, such as: wood carving on Crete, pottery on Crete, Raki factory with distillation of Raki, the making of honey, looms, an old photo gallery of Crete’s most famous crafts, wax factory (candles) and a herbal attic with all the natural herbs you can find on Crete. There is also a farm with all the animals you can encounter on Crete. 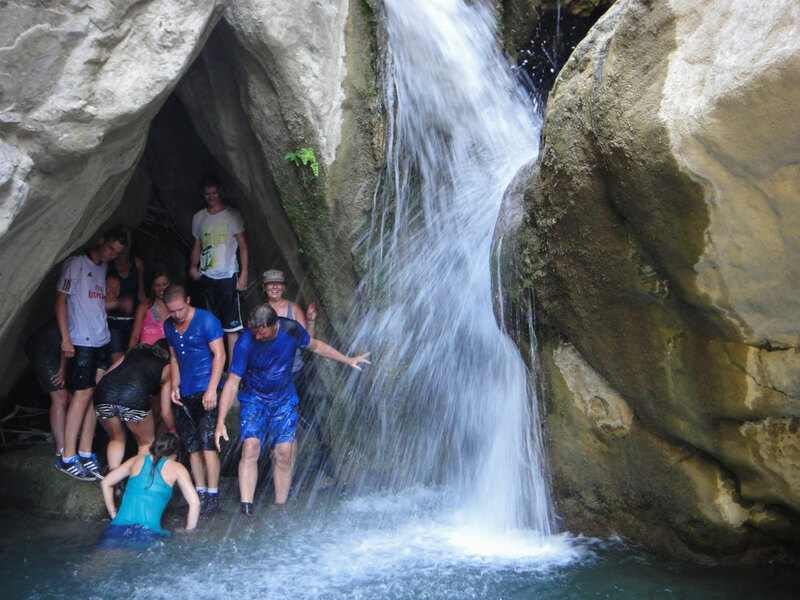 This excursion is including transfer, coffee and lunch in the courtyard of the Eco Park. We offer the option to spend the night here (upon request). 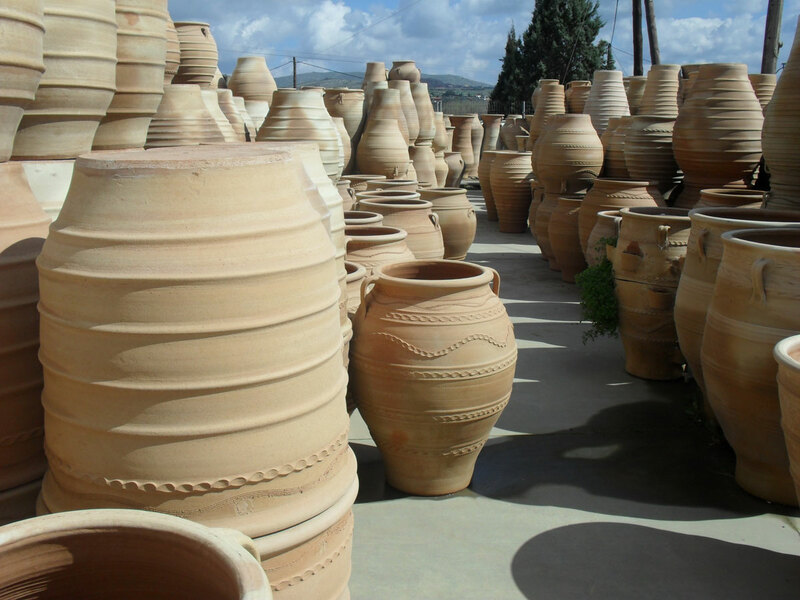 Pottery walk: An excursion through a small Greek village in central Crete. You will be given a lot of explanation about the nature & culture of Crete. Somewhere on the way we visit an old monastery. The total distance of this walk is 5 kilometres. 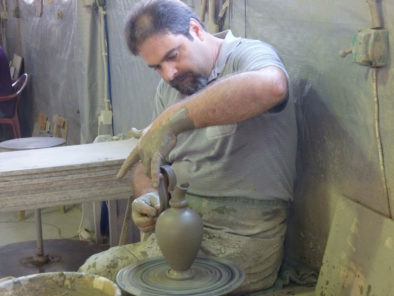 In the afternoon we visit a Greek pottery. Here you learn clay sculpting and the creation you make (like a vase, bowl or candle stick) can be taken home. The children can do unlimited crafts and clay at a long table. This excursion is including transfer and BBQ lunch. 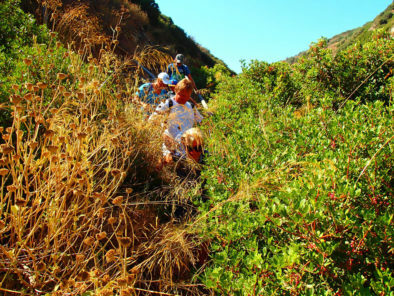 (Children Summer) “The Zorbas Treasure Hunt”: We leave in small groups to one of the scariest areas of Crete! A dropping with several assignments, only for those who dare to join! The treasure hunt is 4 kilometres and we leave at 21:15 hours. 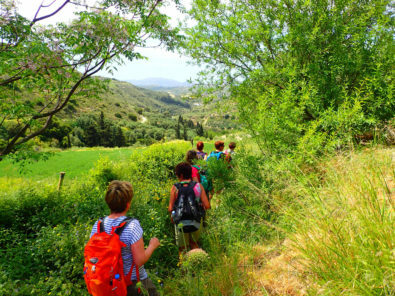 Multi-day hikes on Crete: Heavy hikes (50 kilometres) 2-8 days hiking on Crete: we offer a hike through the ancient Greek donkey trails. We spend the night out in the nature: Hiking week. Scooter tour on Crete: Together with us you can go on a tour with a scooter through Crete, but we also have different routes you can drive yourself. Jeep safari through unknown Crete or Quad safari: A fantastic tour through the countryside of Crete. 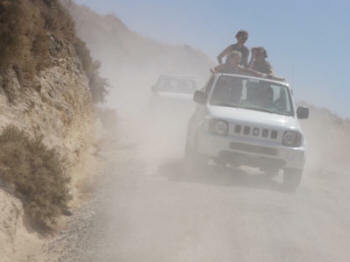 Mainly off road we guide you through the unspoiled areas that have seen very little tourism. 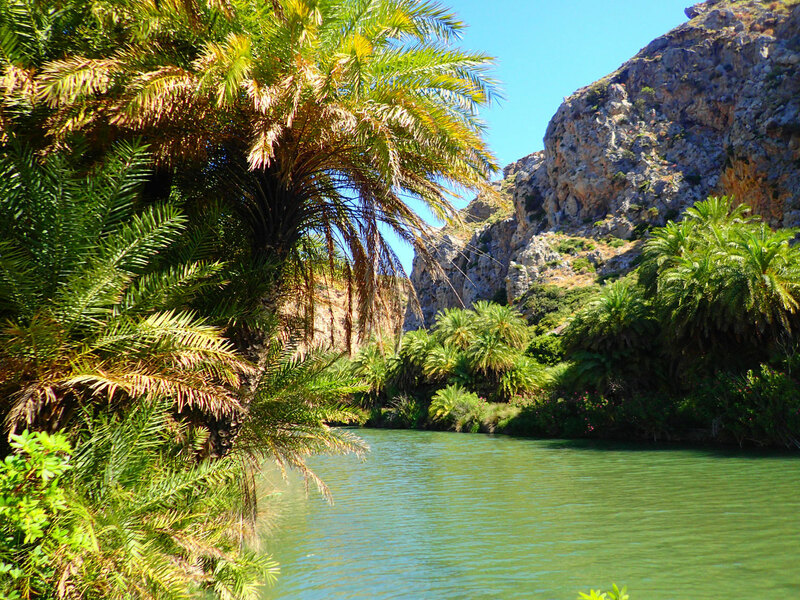 It is a great adventure where you can enjoy some of the nicest parts of the island. 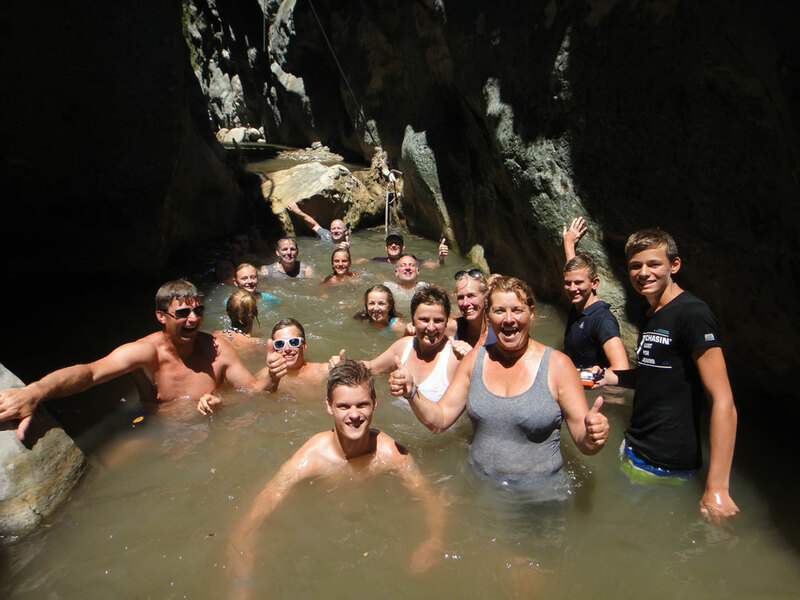 During the summer months (children’s season) we organise also puzzle tours in the mountains, night drops, treasure hunts, swimming competitions, beach party with BBQ, water sports afternoon at the end of the Gournes bay, etc. For more information about a child friendly vacation on Crete click on to: active children’s holidays on Crete. We hope we got you all excited again with the above program and we love to see back in the summer of next year! Sitemap apartments: On this page you find the description of our apartments and holiday homes. 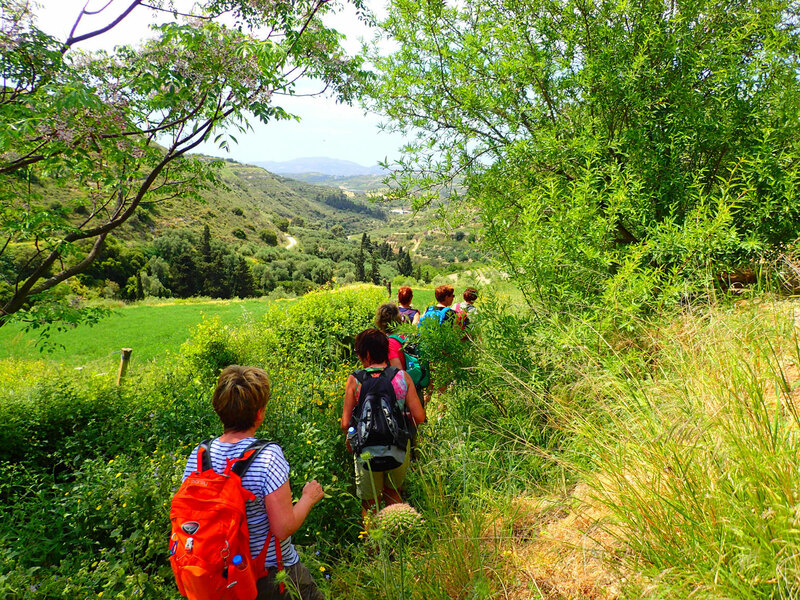 Sitemap excursion: This page gives you a lot of information about excursions during your holidays on Crete. 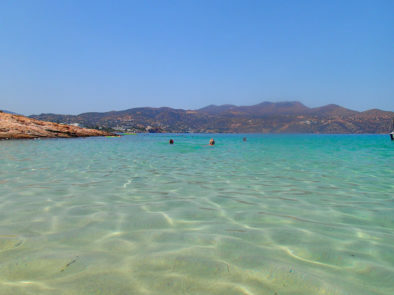 News and daily uploads: On Crete today you find the latest photos and news from Crete. Activities in Crete.